With a research trip to Cambridge on the agenda for next week, I thought I’d look into the possibility of visiting the site of Constance Applebee’s first demonstration of field hockey in the United States. The consensus of all the accounts I have read is that the demonstration took place in a courtyard behind the Hemenway gymnasium at Harvard university in the summer of 1901. 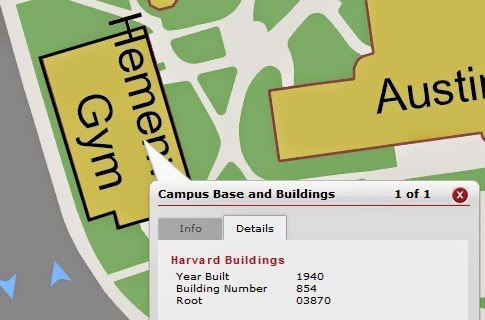 A quick look at a current Harvard campus map revealed the good news: there is still a building called the Hemenway Gymnasium in the north yard of the Harvard campus. A quick click on the “details” tab of the map revealed the bad news: it was built in 1940. I was hoping that this was some kind of mistake, or that the building was simply renovated in 1940 rather than built then, so I went hunting for more information. 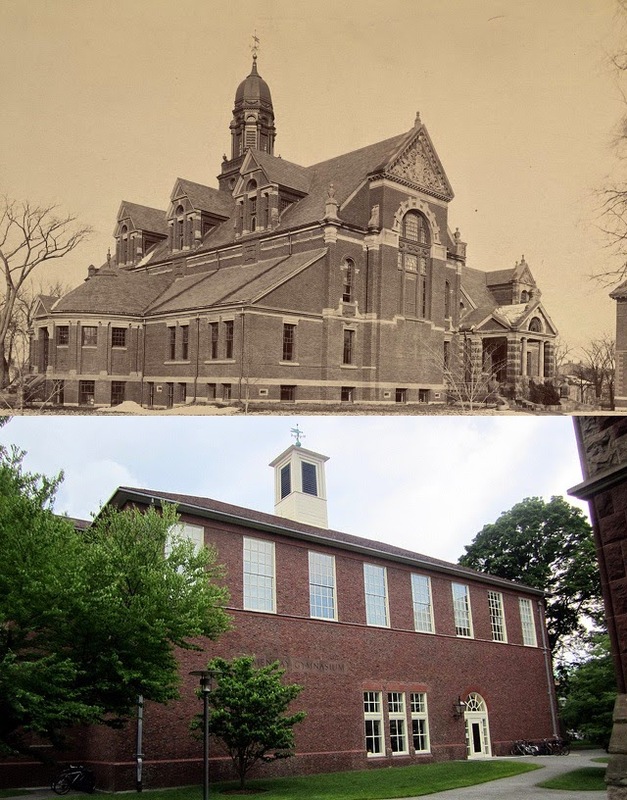 But comparing a photograph of the Hemenway Gymnasium from the late 1800s to the one that stands today convinced me that these were, in fact, different buildings. So, was the new Hemenway Gymnasium built on the site of the old one? 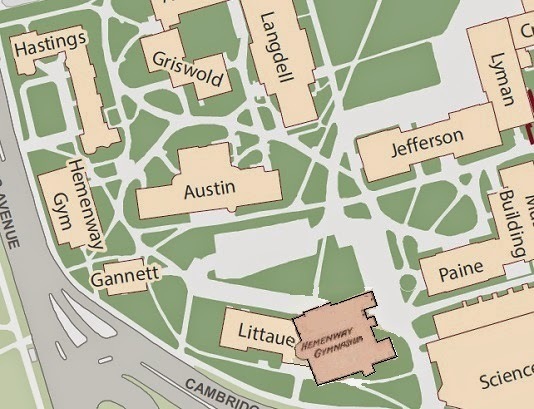 It was time to try to find a campus map from before 1940 in order to find out. Luckily, I came across one from 1888 and was able to compare it to the present map. 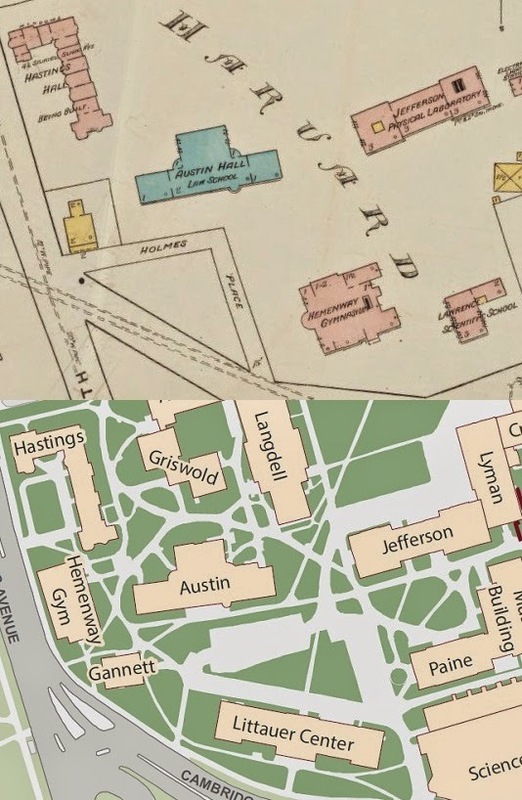 A few of the buildings on the old map are still standing, so I was able to compare their location in relation to the old gym and the new gym. It turns out that the old Hemenway Gymnasium, the one that existed in 1901, was located about 100 yards to the southeast of the current gym’s location. That would put it about where the eastern half of the Littauer Center now stands. As for what was meant by “the courtyard behind the gym,” I don’t have a great sense of which side of the building that would have been on. I will, at least, get to visit the Radcliffe quad, where Applebee first instructed the female students of the Harvard annex later in 1901. Posted on March 20, 2015 March 16, 2016 by Eric MeanyTagged Constance Applebee, Harvard, Radcliffe.